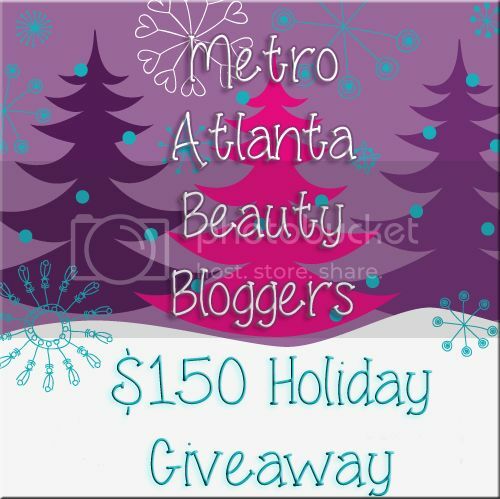 This week, the Metro Atlanta Beauty Bloggers have a very special surprise for you! To give back to our wonderful readers and show our thanks for all the love and support you’ve given us, we’re giving you a chance to win $150! By completing actions in the Rafflecopter widget below, you will be entered to win $150 in the form of a gift card to the website or e-tailer of your choice OR as an instant PayPal transfer. The giveaway runs now through Tuesday, December 10th, 2013 at 11:59 PM EST. Regardless of which blog you use to complete the Rafflecopter widget, your entries will only count one time. However, you may tweet about the giveaway (the last entry!) using the approved message ONCE PER DAY to gain additional entries. Visit any of our blogs to take advantage of that opportunity! Full terms and conditions may be found in the Rafflecopter widget below. Please be patient and allow it a few moments to load. Mandatory entries include providing a valid email address so that we may contact the winner, and following each member of MABB either through GFC or another method of their choice. Once those entries are completed, all other entries are optional and can be completed for 5 additional entries each. A winner will be selected within 48 hours of the giveaway ending, and will have three (3) days from the email notification being sent to claim their prize. If the prize is not claimed within three (3) days, it will be forfeited and another winner will be selected.